I dread to think how many red lipsticks I own. It's something of an addiction and a large part of my love for the classic shade is due to my laziness when it comes to applying makeup. In my opinion, there's simply no other product that can instantly transform your look, adding a polished effect even when the truth is that you've slept in, had minimal time to get ready and applied your lippie on the go. It's my sneaky trick for disguising a hangover as well as my go-to evening look when I want a different focus to the standard smoky eye. Since having lash extensions I've been reaching for my red lipstick more than ever. I don't actually like my mouth that much so it may seem surprising that my choice of lipstick is one which inherantly draws attention to the area yet red lipstick does so much more than that- it transforms the way I carry myself and harks back to a more glamourous era. What's more, there's a shade of red lipstick out there for everyone so if you haven't found yours yet, get looking. Anyway, on with today's review which is of Yves Saint Laurent's Rouge Volupte Perle Lipstick in Mysterious Red (shade 111). Rouge Volupte Perle Lipstick in Mysterious Red is part of the Autumn Winter 2011, out on 17th August. Believe it or not, this is my first YSL lipstick. Although I really like their makeup, I always seem more drawn to their eye and base products. 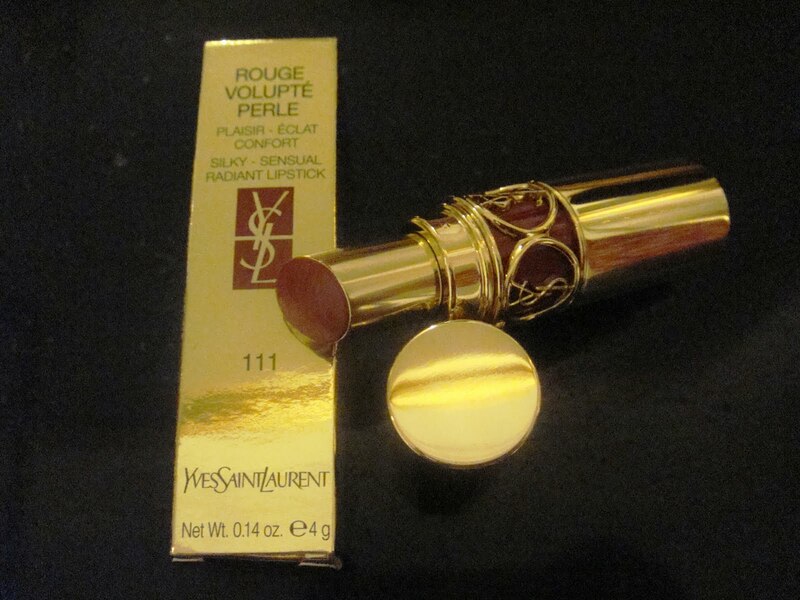 Rouge Volupte Pearl is a new addition to the YSL lipstick line and features six shades. Rather than being presented as traditional "bullets", the formula is in a stick format. The hydrating formula, which contains plumping hyaluronic acid, is an absolute joy to apply to lips, it feels as though it is melting on. There's a refreshing scent to the lipstick which is reminiscent of soothing aftersun. There is a shiny finish but it's not to the extent that you'd receive with a gloss. The colour is rich and warm. I think it would look great on darker skin tones but I may simply be swayed into saying this by the fact that I tried it after a spray tan. Regardless of the brand, when wearing a red lipstick you're going to need to carry the tube with you for on-the-go touch ups so it certainly helps that the YSL packaging is absolutely stunning, reflecting the opulent luxury which the brand is renowned for. £22 is rather pricey for a lipstick but given that red isn't a trend shade, I personally feel that I can justify spending a little more on this classic essential.